Why Should I Freezer Cook? 8 Reasons Why You Can! Why should I freezer cook? We hear a lot of reasons why people don’t freezer cook. But there are several that come up again and again. The idea of having meals ready to go in the freezer is intriguing to people, but they always give at least one “reason” (or ten) why that just wouldn’t work for them. But really let’s call them what they are: excuses! Try everything once. Don’t knock it until you try it. How do you know if you never try? Today we would like to challenge you to think positively. Try something new. Take a risk. We challenge you to reassess the reasons you give for NOT freezer cooking. But we won’t leave you hanging without our 8 best freezer cooking tips to get you started, because we know that just about anyone CAN freezer cook! 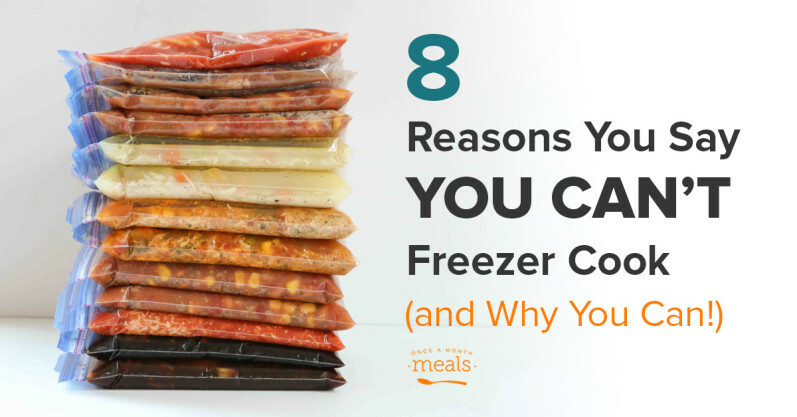 Here are our answers to 8 of the most common freezer cooking excuses! Fine, then go through the drive thru. Ok, that was snarky, but really! If you aren’t willing to commit to spending a a bit of effort on a weekend once a month (or even every other month!) so that you can have tasty, healthy, easy meals, then this just isn’t for you. You say, “Why should I freezer cook?” I say, do it because it will SAVE you time! Be a grown up, and mark it on your calendar. We promise that you will thank yourself for making the time for what matters most to you. You don’t have to cook from dawn until dark. There are many ways to shorten your time in the kitchen on cooking day, but our favorite is the Mini Menu (You can try one for free at the bottom of this page!) When you can pack 10 or more meals into the freezer in an afternoon, that is a WIN! Curiously, this is an excuse that people give for many valuable activities, including the gym. Find out how a freezer cooking membership is a lot like a gym membership HERE. 2. I try to eat healthy, but freezer meals are mostly casseroles and canned foods. Not true at all! We have SEVEN healthy meal plans from which to choose. Take a look at some of our recipes. Our meal plans include Diet, Real Food, Paleo, Gluten Free Dairy Free, and Allergen. Our menus focus on the regular sale cycles, but also on fresh, seasonal produce. You can read a short description of each of the meal plans HERE. Once you start meeting people in our Community, you might be surprised to find that a large percentage of them are health nuts bent on encouraging one another to eat better! You say, “Why should I freezer cook?” I say, because it will help you to eat a wide variety of healthy foods! 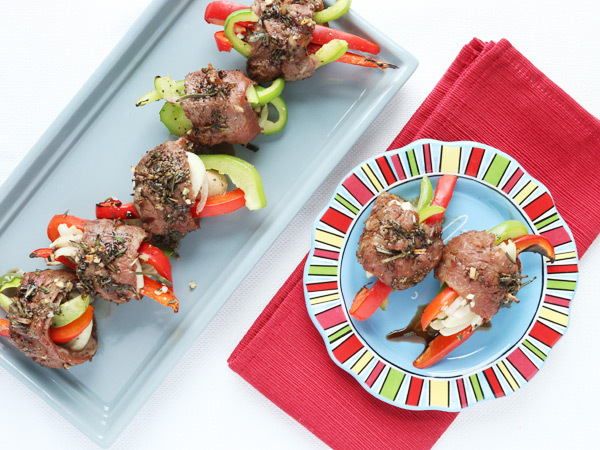 Balsamic Steak Roll Ups – freezer meal! 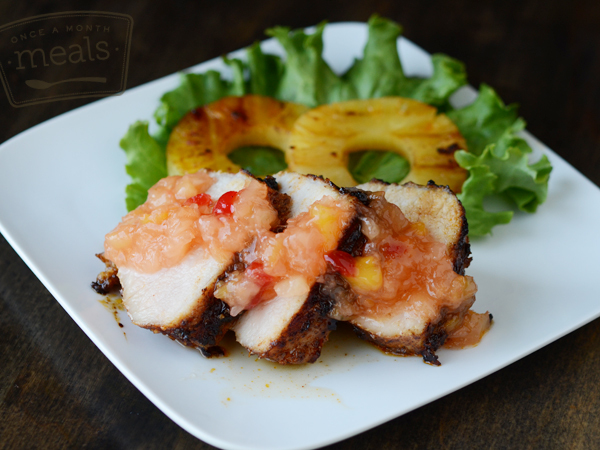 Spicy Pork Loin with Pineapple Upside Down Jam – freezer meal! 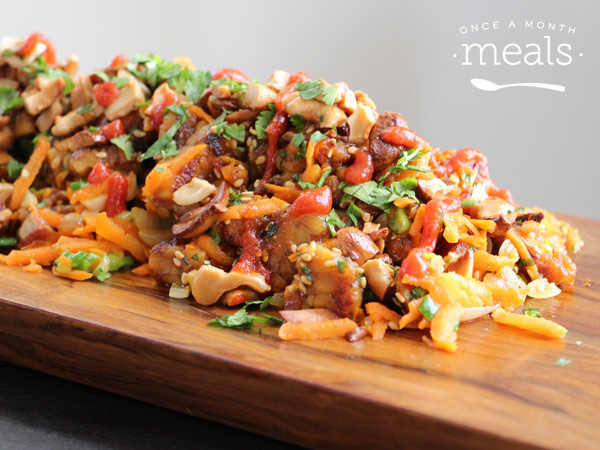 Cashew and Tempeh Salad – freezer meal! 3. No really! I’m allergic to ______, so I can’t find any recipes. We are committed to providing freezable recipes to everyone, including those with food allergies, sensitivities, or special diets. With a Membership, you can easily search our database of over 5,500 recipes to find the ones that meet your needs. Our Allergen Menu focuses on a different specialty diet each month, and we are constantly adding new recipes for each category. Freezer cooking is the perfect way to remove the panic of cooking allergen free meals 3 times a day, 365 days a year. You can even package allergy friendly freezer meals in single servings to take with you when you eat away from home. 4. It is really just too much food. I’m afraid it will all go to waste. Let’s be real. Freezer meals aren’t going to spoil anytime in the next 3-6 months! Can you really tell me there won’t be a time – ever – in the next 3 months when you need a quick meal, or need to feed extra people, or take a dish to a potluck, or a meal to give to a new mom or someone else who is in need? Do you ever buy something intending to cook it, and then end up throwing it away because life got so busy that you never got around to it? Maybe something was on sale, so you stocked up. But then you couldn’t use it all before it went bad so it ended up in the trash. Freezer cooking actually helps you plan ahead and utilize everything you bring home from the store, so you waste less. Shopping with an organized grocery list also helps you save money. You say, “Why should I freezer cook?” I say, because it will help you stop eating out! And we all know THAT will save you money. Also keep in mind, you don’t have to cook for an army! When cooking our recipes, you choose how many servings, even if it is only one or two. No multiplying, dividing or converting necessary. Simply choose a number and our software updates all of your documents with one click. Only need a few meals each week? Cook a Mini Menu or create a custom menu. 5. I’m not a good cook. I’m helpless in the kitchen. Well, none of us are pros either. We write our recipes and meal plans for the average cook. Before you even start cooking, you will work through our prep list so that every ingredient is chopped and ready to go when you cook. Each menu comes with detailed recipe cards for each meal, including how to portion, freeze, and thaw. We even give you cooking day instructions that give you a step by step process to maximize your efficiency and finish your freezer cooking menu. If you are still stuck, don’t worry. This is a Community where we help one another! Talk with other members who freezer cook. Check the blog for Helpful Hints and Kitchen Tips. Or click the orange “Help!” button in the bottom right-hand corner of the page to live chat with the Once a Month Meals staff. You just might learn something! 6. Freezer cooking is so complicated. I’m really confused. Was that complicated? We designed Once a Month Meals to simplify freezer cooking. And freezer cooking simplifies your everyday routine by completing the biggest daily chore all in one day. We love simple. And if you are feeling a little lost, please let us or someone else in our Community hold your hand for the first go around. If all of the choices and variety are too complicated, then start with a Mini Menu. Start with our Traditional Menu. You don’t have to create complicated custom menus unless you want to. We have hundreds of menus ready to go. Just print your documents (you don’t even have to make a grocery list! ), prep, cook, freeze, and then enjoy! 7. I like to meal plan and shop weekly. Ha ha! No really. I’m laughing right now. Are you seriously telling me that you head out to the grocery store each week with a spring in your step and an organized list in your hand? You delight to prepare dinner every evening and serve it piping hot and right on time with a smile on your face? No sweat? I’m not saying that freezer cooking will eliminate grocery shopping or meal planning from your life. But wouldn’t it be nice if when you sat down to plan your week you could count on several easy freezer meals from your inventory? I sure would! Because I personally break out into a sweat every time I sit down to meal plan! You say, Why should I freezer cook?” I say, because planning ahead always helps you stay sane in this crazy life! If a short term menu plan works better for your schedule or budget, keep in mind that you don’t always have to cook a whole month’s worth of food. Mini Menus are perfect for short term meal planning. You will prep 10 meals total, so stick 5 meals in the refrigerator for the first week, and put the other 5 into the freezer for the following week. Once you have cooked your meals you don’t have to think about it again! 8. I like the idea of freezer cooking, but I just can’t make it work. I don’t know where to start! I’m overwhelmed! Take a breath. And then just try it! New things are always a little bit scary, but it gets easier the more you do it. Set aside a day on your calendar. Peruse our Get Started Series. Sign up for a Once a Month Meals membership and choose a menu that looks yummy. Yes, freezer cooking is a commitment, but one with a huge payoff. We have done all of the hard work of creating the menus, the documents, and even expert advice. The least you can do is give it a try. If you break down in tears in the middle of your kitchen, then get to your computer fast, and click the orange “Help!” button. We will hold your hand. You can do this! Great suggestions but my reason for not freezer cooking is because most freezer meals are created for 4-6 hours in a crock pot. I am gone from my house for closer to 10. The food is dried out. Any suggestions? Oh, interesting! Does your slow cooker not have a “keep warm” setting once the meal is done cooking? I have left my pot on for 8-10 hours easily. You might also like an Instant Pot – you can cook from frozen once you get home! It also has a slow cooker function and will keep food warm once done cooking!! My reason for not doing more freezer cooking is because I am feeding a family of 10! Most recipes adjusted to serve 8 are the correct amount, but seriously, that is a lot of food! When I tried it before, it was very difficult to cook such large amounts at one time. 10 or 12 meals, times 16 servings (enough to serve each meal twice). My pots and pans were not big enough to accommodate the 16 servings for some dishes and it just became overwhelming. I tried dividing the menus up and just cooking a few dishes each day over the course of several days/ That worked a little better, but still, there were plenty of kinks to work out because of the amount of servings I am dealing with. My suggestion is to start with a recipe or two for the craziest meal of your day. If it is breakfast, then try making breakfast burritos or muffins and see if it works for you. Then move to another meal and try doubling a recipe or throwing some extra meat on the grill. Freezer cooking is really a mindset. If you see something yummy on clearance, grab it separate it into the portion sizes you need it and freeze. I haven’t tried freezer cooking yet because of my picky eater. My oldest is on the spectrum and textures really bother him. He is a creature of habit so new foods are difficult to introduce without making dinner time a stressful endeavor. However, with a new stand alone freezer coming in 30 minutes (yay! ), I’m thinking I will try some meals every few days, find the ones he likes, and freeze them in individual servings for nights I make other freezer meals he won’t eat. Gotta start somewhere, right? Having four kids with picky palates, a hubby on bypass restrictions, and myself daring to try the Whole30, I’m going to need all the help I can get! Good luck and feel free to hop into chat when you have questions! This method of cooking is great if you actually have at least 30 mins a day to cook on days that you work….which is what I need. If you work 12 hour shifts, eat dinner at 3 pm or 3 am and you don’t have a schedule that actually allows you to eat at home, much less prepare it, this will not work. I need ALL of my meals precooked and ready to throw in the microwave at work so I can wolf it down in the scant 15 mins I end up with to actually eat! Hi Lori, We still think freezer cooking could work for you. What we would suggest is prepping what we call ready to eat meals. These meals only require thaw/reheat on serving day so you don’t actually have to cook them. These would be pre-cooked meals as you mentioned is what what you need/are looking for. You can check out all of our ready to eat meal recipes below. Hope this helps! I haven’t freezer cooked yet, because my freezer is tiny and I don’t have the space to store the food.